Chicago IL Photographer: Aurora Borealis at a sky near you? In 2000, shortly after the Y2K scare, I helped a friend move from Wisconsin to her old home in Alaska. She has two children, so a road trip was out of the question. I had the time available, so I drove her car from Kenosha to Anchorage. It was a 4-day trip I'll never forget. Perpetual sunlight is something everyone should experience. I've been a city boy my whole life, so seeing young bears running across the road and a moose hanging out in the backyard was a mind-bending experience. The air around Anchorage smelled like flowers everywhere I went. Nature takes advantage of the few weeks of warm weather by going in fast-forward. I swear I could see the grass growing! Since it was early in the year, I was bummed to be missing the Northern Lights. But thanks to a random google search I did this morning, I just discovered that the Northern Lights are closer to home than I realized. From SpaceWeather.com: "Contrary to popular belief, you can photograph auroras in places like California and Florida about once a year. The trick is knowing when to look. (2) September, October and November are consistently the best months to see auroras. Why? It's a bit of a mystery." The fact that I lived my whole life without knowing till now that I could witness nature's best light show makes it a little more clear just how rich this world is with diverse beauty. Makes you want to go grab your camera, doesn't it? Thanks Frank, glad they are enjoyed. Hope you get some Auroras soon. Would be nice if this current solar stream would work out, but guessing clouds might be an issue if they do. 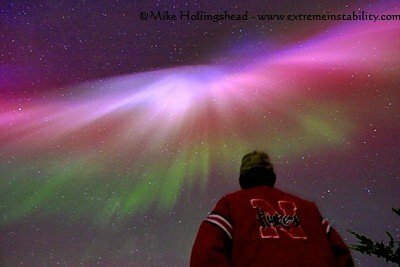 My daughter, son and I witnessed the Aurora Borealis at about 9:30 P. M. IN A VERY BEAUTIFUL, "RED" SKY. ( KING, NORTH CAROLINA) (STOKES COUNTY).The sky, (all over), as far as we could see, was a rosy red, with stars brightly shinning through. It was simply beautiful! I "guessed" that it was in fact, the Aurora Borealis, that I have read about, and Channel 12 News confirmed it on the evening news, stating that they had heard about it "only".,from a lot of Stokes County residents. It was a very beautiful ending for our day, and also, a wonderful contribution from Nature, to a well-deserved section of "our" Earth.